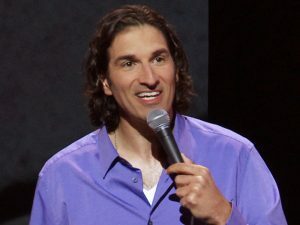 Stand-up comedian Gary Gulman approaches his journey with depression bluntly, though when he first began to discuss it on stage, he didn’t utter the word. During a set on “The Late Show with Stephen Colbert” in January 2017, Gulman spoke about sleeping for more than 12 hours from night into the next afternoon (“I slept through an entire ‘m’”), using a fork to eat ice cream (all the spoons were dirty) and living with that perpetual pile of clean clothes that never gets folded. “The Great Depresh” tour rolls through Plymouth’s Flying Monkey Movie House and Performance Center Friday night. NHWeekend spoke with Gulman, from Peabody, Mass., about his life and outlook. Did you always know you were going to be a comedian? It was something that I was obsessed with. Stand-up comedy was something that I sought out everywhere on television. I would stay up late to watch stand-up comedians on the late shows. And then I started to have access to cassette tapes of comedians and albums of comedians. So if you had told me I had a choice of being three things, I would have said a basketball star, baseball star or a stand-up comedian. Stand-up comedy was something that I was very devoted to and thought about. But the idea of writing my own jokes and performing them probably didn’t come into my mind until I was in high school. It just seemed like something that was unrealistic. I didn’t know anybody who had gone that route personally. What did you like about growing up in Peabody? There were a lot of parents who were willing to coach sports for free and just volunteer. Even though I grew up in a single-mom home, I had a lot of mentors. I’m very, very grateful for that. My first love was basketball. I had a lot of very helpful coaches when I was very young. It sounds cliché, but the lessons I learned from sports about dedication and hard work are so valuable to me. There were so many different basketball leagues in TV and on the North Shore. So I was very lucky. How did sports help you get into comedy? I think I applied a lot of the principles of hard work and habit and dedication to comedy. That made me an above-average basketball player. (And it) made me an above-average comedian. I put a lot of hours into writing and perform as frequently as possible. I found that my sports background was appealing to other people. I played football (at Boston College), so that probably gave me a leg up in the competition.